Oh, the lameness that exists here at la casa Gringa. I'm so behind! Right on schedule, my wonderful sock pal's package for me arrived full of goodies from the heartland. My pal was Megan (Knitstasher11) from MIssouri, and she sent me the coolest package! First, my socks. 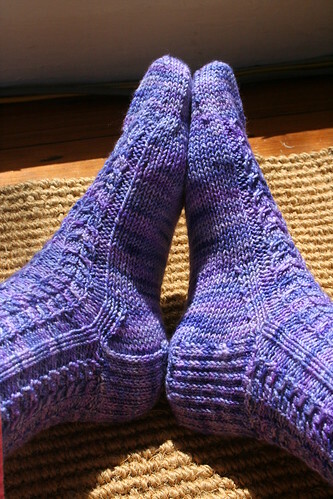 They are made from Rowan 4 Ply Cotton, and the pattern is Laura's Fluted Banister Socks. They fit perfectly, and have just the right amount of stretch.The socks came with an adorable scrapbook of where they've been so far -- everywhere from my pal's son's soccer practice, to Arkansas for a business trip, to Texas for the birth of my pal's first grandchild! She also sent two more balls of Rowan 4 ply Cotton, a cute keychain sock-blocker (for mini socks), and some honey-toasted peanuts (mmmm, peanuts). I was spoiled! 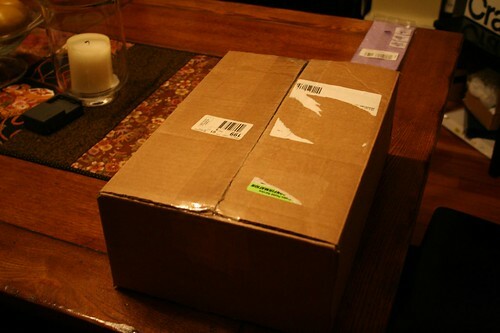 So, you might ask, if I got my package on time... why wait so long to post about it? 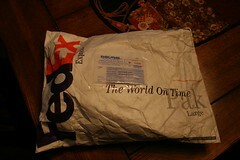 Because my package to my pal was not nearly so punctual! I did finally get it out last week, though, and now that I know that she's got it, I can spill the beans! 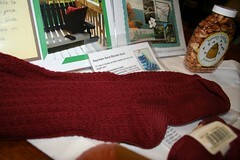 So, another Sockapalooza successfully concluded -- thank you for organizing, Alison! The package was from Andrea of Mexico City, and boy did she treat me right. Perfecto para La Gringa, no? 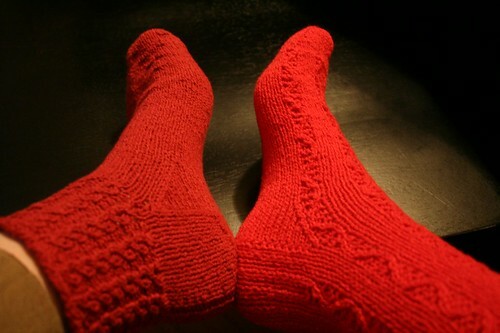 That's right, I got two pairs of gorgeous red socks. Two! They are knit from Circulo Fixacao which Andrea noted is essentially the same as Cascade Fixation. And she designed them herself. The socks are fantastic and fit me beautifully. I never imagined that I'd love the ankle socks as much as I do. In fact, I still have them on right now. But as good as the socks are, there was more! A ball of the Circulo Fixacao in a kicky turquoise (si, Andrea, a mi me gusta este color! ), three beautiful postcards, a small handmade wool bag (sort of hidden under the postcards in the picture) perfect for carrying around a small project, and a long letter. The letter explains why she and I were a perfect pair. I can only wear cotton socks, and the Circulo Fixacao is one of only two sock yarns available in Mexico. We both speak Spanish (me dio alivio darme cuenta que si, todavia se leer espanol!). Obviously Alison did her homework matching us up. But here's the weird part. Andrea wrote that her family has a speciall affection for Ecuador! Her family hosted Ecaudorian medical students training in Mexico, and she herself visted the country a while back. (Andrea - parece que visitaste a todo lado!) What a wonderful coincidence. Muchisimas gracias, Andrea. I love it all! Thanks, Alison, for being such a great hostess -- and not telling any of us to go... well, you know. 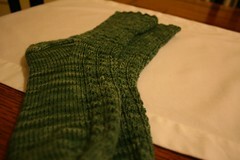 My Sockapaloooza socks are all done -- blocked, ends woven in, and photographed! 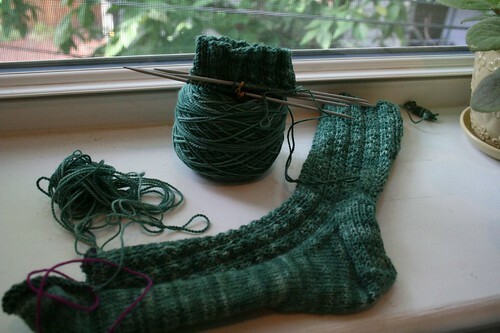 These socks went really fast, and the pattern was easy to memorize. And how about this for a bonus: there's enough of that yummy Koigu left over for a pair of baby booties! 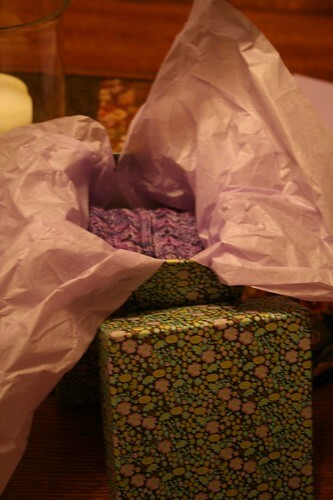 My next fun task is gathering some treats to put in my pal's box. I'm enjoying this so much! Remind me why I waited until round three to become a Sockapalooozer? 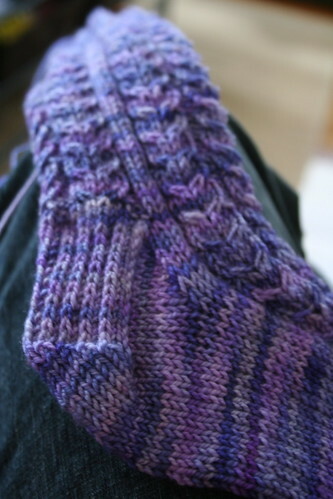 The picture's a bit fuzzy (taken with my phone while Jason was out of town with the "real" camera), but you can just make out the fact that my Sockapaloooza socks are (1) done!, and (2) blocking on sock blockers! I used this tutorial to make them myself out of wire hangers -- it was very easy, and a good way to get wire hangers out of my closet where they spend their time putting unsightly bumps in the shoulders of my favorite tops. I'll take better pictures this weekend so you can really get a sense of the purple-y goodness of this colorway. 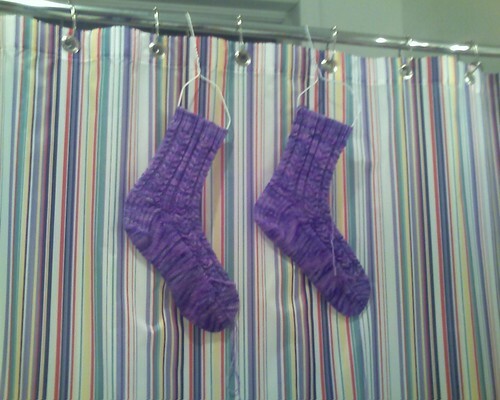 And as if the candy colors of Sockapaloooza socks and my shower curtain weren't enough, I leave you with a picture my mom took for the digital photography class she's taking at a local community college. I think she gets it! The real color. Sort of. When I went looking for an object around the house to include in a picture for scale, I ended up at our "bar". It's actually a child's dresser that was my dad's as a child, then mine. It's been painted and repainted several times, and does quite well as a bar. Anyway, the late afternoon light is good at the bar and Jason was already in the kitchen cooking Mexican food, soooo the sock posed with a bottle of tequila. Which I then grabbed and went into the kitchen to make margaritas. 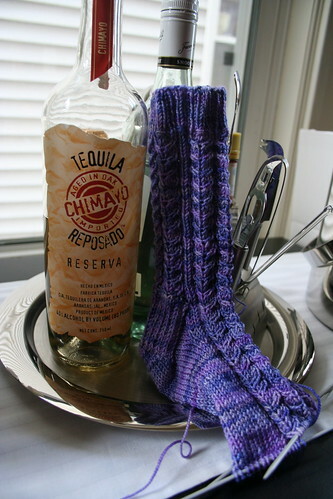 *The Drunken Sock. Though much of the Spanish-speaking world uses the word calcetin for sock, in Quito it's almost exclusively media. One of those idiosyncratic things that marks me as somebody who learned Spanish in Quito. I love it. Note: This was actually written on Wednesday (yesterday), but I encountered technical difficulties and couldn't publish until this morning! Is there such a thing as a too-stiff sock? Pictured here are my Sockapaloooza socks (version 2.0) -- you'll notice that I've switched Koigu colorways since this entry -- and I'm quite pleased with the way the pattern and the colors are working together. Now, a new worry: I had to make adjustments to accommodate my absurdly loose knitting, and now I fret they may be a bit stiff. (Notice, above, that the sock is standing without support!) Is this a problem? 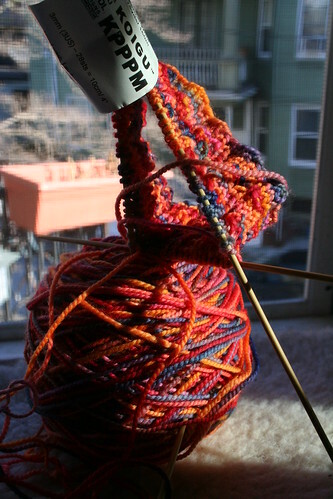 If I call a do-over and restart on bigger needles I'm almost certain it will be way too big -- it stretches out to fit nicely now when I slip it on. Any words of wisdom? On this Wednesday, some of you might be wondering where the heck the promised Olympic wrap-up entry -- complete with pattern! -- is. Two things have been slowing me down: a maddening lack of sunlight this week for taking nice pictures and something we'll call "Hey! This pattern-writing thing is hard!" It's coming soon, I promise! Thank you for your compliments and well-wishes yesterday! I'm happy to report that I am already much improved in the health department -- far less of that not-quite-a-sneeze-but-enough-to-make-your-eyes-water feeling, thank goodness. I'm looking forward to getting home and working on the official Olympic sweater round-up entry, but to answer the two most common questions: (1) yes, I will be writing up this pattern, and (2) yes, I am thrilled with the way the sweater came out! 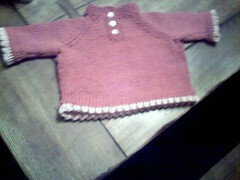 WIth the Olympic sweater finished, I've got a rip-roaring case of startitis. I'm trying to be good, though. With sweater weather drawing to a close for the year, I still have two big sweaters on the needles I'd like to get done before it's springtime in Boston: Pam and Zippy. So they are first on my knitting to-do list. Still, the urge start something new is strong. 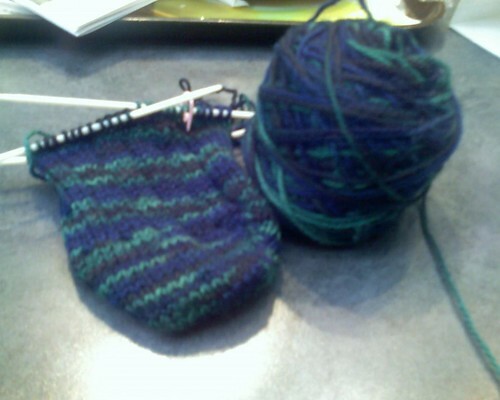 So I'm dealing with it by allowing myself to start only the smallest projects I can think of: socks. And the first step toward new socks is... new sock yarn! When I last saw Alison, I walked away from our visit with a bag of it! The Regia on the left is Regia Cotton India Color in the Bombay colorway, which Alison kindly brought back for me from Germany. I love the browns and oranges, and the hint of blue will make them perfect jeans socks. Can't wait. 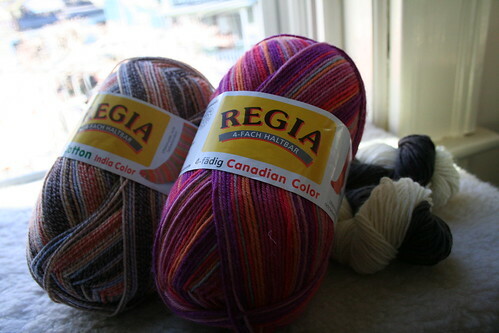 I also nabbed the Regia Canadian colors (Manitoba) on the right and the black and white Lorna's Laces Sheperd Sock in the back when she pruned her sock yarn stash -- I got 'em for a song! I think I might finally make some Jaywalkers from the Lorna's. A few days later I went hunting for some Sockapaloooza sock yarn. 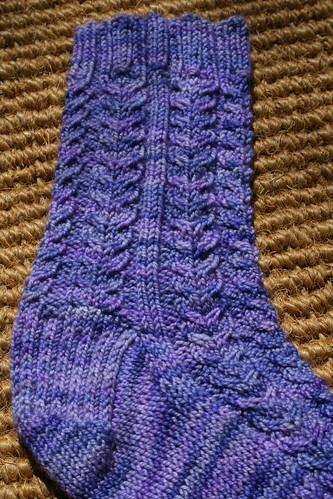 Having decided on the Conwy socks from Knitting on the Road, I thought I'd treat my pal right and use some Koigu. Since the sock in the book is knit up with a variegated yarn, I figured I could go crazy colorful. I definitely love this colorway, but the jury's still out on whether this colorway might be just a little too crazy colorful for cables. This isn't new sock yarn, but I should still include it in my current sock round-up. 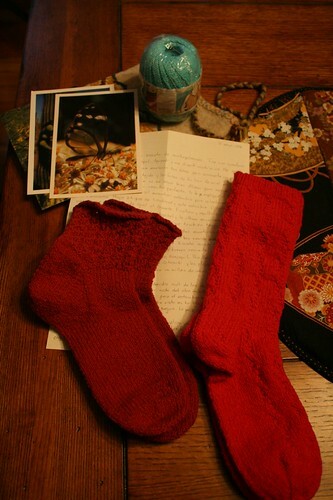 This is the second of Jason's Christmas socks, which I insisted on re-knitting when I saw how big they were on him. After a two-and-a-half month post-Christmas break, I'm back on track with these. I'll be home tomorrow night, so look for the Olympic sweater round-up this weekend! I got a camera phone. Guess what my first public picture was. Taken with my normal camera. I love knitting, and I especially love baby girl knitting. But you can forgive me if I was less-than-overjoyed about this project, since it was the third deadline-knitting project I've worked on in the last week. 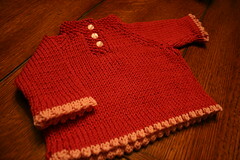 (Score: two deadlines made [the sweater above and this one], one missed.) When I finished this little number I looked at Jason and said, "all I want to do is sit down and knit mindlessly on a sock for a while." Lucky for me, I had materials on-hand. When we were in New York last weekend for a birthday celebration, I managed to carve out an hour to explore Knitty City. It's a small store, but well laid out and friendly so you don't feel squashed or unwelcome. (This is a nice contrast to the other yarn store on the UWS. If you know what I mean.) I was greeted but then left blissfully alone to browse and fondle yarn. Help was readily available to those who needed it, though. The owners are a married couple, and I watched him help a customer struggling with the swift and ball winder (they'll wind your yarn, or you can do it yourself!) and later listened to her gently guide a novice knitter to a better color combination without the customer even realizing how narrowly she'd escaped color disaster. They were quite a team. The two non-sock yarn brands that stand out in my memory are Lily Chin and Cascade, but I spent most of my time in front of their sock yarn selection. There was ArtYarns Supermerino, lots of Regia (including some Nations! ), Trekking, Opal, Cascade Fixation... the variety was quite good. Armed and ready for sock knitting! My need to touch all yarn under consideration for purchase is well documented, and I must say that when I grabbed a ball of Regia Silk Color I was blown away by how soft and smooth it was. Suddenly, two balls jumped into my basket -- all on their own, I swear! Two skeins of Supermerino in this colorway -- which I may use for my Sockapaloooza pal, all depending on finding a pattern -- leapt in right after them. Speaking of Sockapaloooza, I haven't uttered a word about it since I signed up! I didn't totally neglect it during the Olympics, I promise. My pal has indicated that lace or cables would be good, and since my socks have heretofore been limited to plain stockinette or ribbing (if I'm feeling adventurous), I've invested in Nancy Bush's Knitting on the Road to broaden my horizons a bit. But for now, just for today, I'll take my horizons just where they are thankyouverymuch. Me and my aching fingers are going to go round and round on a Regia Silk sock and not worry about deadlines or medals or shipping cutoffs for at least 24 hours. P.S. -- Have you seen the new Rowan magazine? I like it! A pretty and stretchy cast off -- it's a miracle! It will come as no surprise to most of you that the answer to last week's question (what's the best way to bind off a toe-up sock?) 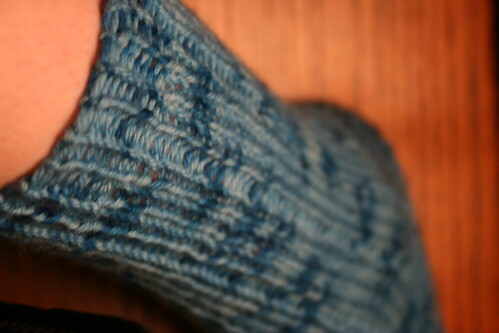 was the tubular bind-off. In my own defense, I had tried it on this sock before throwing myself on the mercy of the blogosphere. At the end of the sock I dutifully pulled out my Knitter's Handbook, girded myself for Montse's somewhat (*ahem*) didactic style, and gave it a shot. Verdict? Too tight. I now know that the problem was that the book recommended doing at least two rows of tubular knitting (k1, sl1 on one row, then sl1, k1 on the next) before the bind off. In retrospect, I'm sure the bind-off itself had been plenty flexible, but all those slipped stitches made the cuff too tight. When I consulted the links that people kindly left last week, I saw no mention of the pre-cast-off tubular rows. 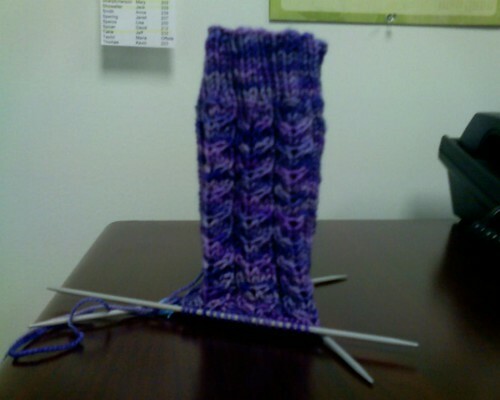 Last night I gave it one more shot, this time knitting the 1x1 rib normally up to the cast-off row. I used this tutorial combined with what I already knew of grafting, and it worked like a charm. Now I can finish the second sock (I've been dawdling on it until I figured out the cast off) and chase away the winter grays with this fabulous turquoise colorway. Success! In the midst of my sock-related euphoria, I signed up for Sockapaloooza -- my first sock exchange and my second knitalong in as many weeks. It's gonna be a busy February!